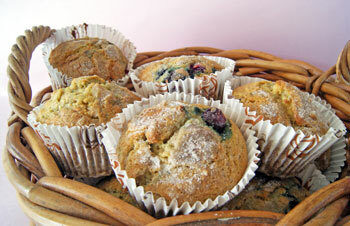 These healthy blueberry muffins are so good you won't believe that low fat could be so tasty. Made from blueberries, egg white, yogurt and a small amount of butter to reduce the calories, they are spiced up with the addition of allspice. To keep them healthy, use low fat margarine and low fat yogurt. Use either natural yogurt or blueberry flavored for an extra burst of flavor. Enjoy these blueberry muffins for breakfast or a mid-morning snack. Preheat the oven to 190ºC / 375ºF. Place paper cases into a 12-hole muffin tin or brush the holes with melted butter. Sift together the flour, baking soda, salt and half the allspice into a large mixing bowl. Add 6 tablespoons of the sugar and mix the ingredients together. In a separate bowl whisk the egg whites together. Add the margarine, yogurt and vanilla extract. Stir until the mixture is smooth and the ingredients thoroughly combined. Make a well in the center of the flour and stir in the liquid ingredients. Mix until almost combined. Add the blueberries and continue mixing until the flour is just incorporated. The mixture will still be lumpy, but that doesn't matter. Be careful not to over mix. Spoon the mixture into the muffin cases, dividing equally between the 12 holes. Mix together the remaining sugar and the remaining allspice, then sprinkle over the top of the muffins. Bake in the oven for 25 minutes or until the tops are golden. Leave the muffins in the tin for 5 minutes then turn out onto wire racks to cool completely. If you don't have fresh blueberries, use frozen. These will work just as well. Thaw them first, then drain away the liquid.